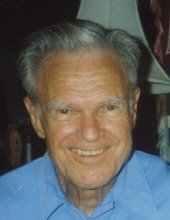 Gerald E. Jenner, who lived a life devoted to family, faith and service to others, died peacefully March 24, 2019 at the Hitz Memorial Home in Alhambra, IL. He was 95. Funeral services will be conducted Saturday, April 6, 2019 at 4 PM at Mt. Nebo Primitive Baptist Church. Private burial will be in Mt. Nebo Cemetery. Friends may call Saturday, April 6, 2019 from 2 PM until service time at the church. Born May 10, 1923, in Pocahontas, IL, to Wallace Arthur Jenner and Elizabeth Mueller Jenner, he was the youngest of nine children. He grew up during the Great Depression, where his slow walking and talking earned him the nickname Speed. He worked his way through college, then enlisted in the Army during World War II. After basic training, he was sent to the European Theater where he served as a member of the infantry. His role was to aim and record Howitzer fire, and his guns fired more than 1,500 rounds in combat. His unit pursued the enemy across Italy and parts of Germany, where they were the first Americans to enter two concentration camps. After the war’s end, he remained in southern Germany as part of the Allied occupation. During the war he received a number of letters from Martha Mollet, of rural Greenville. In 1946, when he was discharged, he returned to Illinois, sought Martha out and quickly proposed. He was crushed to learn he was just one of many GIs she wrote to during the war. She saw it as her patriotic duty. When his proposal was rebuffed, he completed his degree at the University of Illinois and joined the sales force of Upjohn, a large pharmaceutical company. He was assigned to a territory based in Milwaukee. After several years Martha, realizing she had let a good man get away, wrote once again to Gerald and rekindled his interest. Finally, on June 28, 1952, they were married in the front yard of Martha’s parents, Mike and Polly Mollet, in Terrapin Ridge, seven miles west of Greenville, IL. The newlyweds set up housekeeping in Milwaukee, WI. Gerald’s career with the Upjohn Co. spanned 37 years. It took them to Alton, IL., in 1957, then to Creve Coeur, MO., in 1967. The St. Louis move came after Gerald was promoted to sales manager, having been recognized as a top salesman on several occasions. His new position had him responsible for sales representatives in the eastern half of Missouri. Upon retiring in 1984, Gerald and Martha moved back to Terrapin Ridge, where they built their dream home. In retirement, Gerald planted hundreds of oak and walnut trees on the family property. He and Martha quickly became active in the community participating in Kiwanis, the Senior Center, The Historical Society, The Genealogical Society and the Greenville Chamber of Commerce among other activities. Prior to moving to Bond County, Gerald had become involved in genealogy, in part from his discovery that he and Martha were both related to the File family. His research led him to write a seven-volume history of the File family, beginning with Henry Oliver File, born in 1776. His genealogical interest continued after retirement and led him to map several rural cemeteries. To help raise money to support these cemeteries he wrote histories of the people buried there. He wrote “The Story of Early Pocahontas and Sugg Cemetery”. Sales of the books helped raise thousands of dollars to pay for the cemetery to be mowed and maintained. He also wrote books about Old Mt. Nebo and the present Mt. Nebo Primitive Baptist churches and Mt. Gilead Church. Gerald had an unshakable faith in God and held a very ecumenical view of Christian unity. He was raised in the Methodist Church, spent much of his adult life as a member of a Presbyterian Church, and was a member of Mt. Nebo Primitive Baptist Church in his later years. He supported all Christian churches in Bond County and was friends with many pastors. He knew the Bible well and lived his life by the Golden Rule. His life was a public expression of his faith and love for God and his fellow man. When Martha was hospitalized in 1999 and experienced multiple organ failure and sepsis, his stubborn positivity played an important role in keeping her alive and aiding her recovery. His faith was later shaken when Jane, his youngest daughter, died after a short struggle with an aggressive form of leukemia on Oct. 7, 2003. Nonetheless, throughout his life he maintained an unsinkable positive outlook right up until his death. Gerald Jenner lived a remarkable life. In many ways, he lived the American dream. Devoted to his family and faith, he was humble and kind, and always serving others. For example, he had a personal goal of donating his weight in blood; over the course of his life he finally reached the 20 gallon milestone. In addition, when his daughter was fighting cancer, he began giving platelets. Platelet donation takes longer and uses a bigger needle, but the donor can give every other week. Realizing how essential platelets became to his daughter’s existence he dutifully gave them twice each month. He continued traveling to St. Louis for a year after Jane’s death in order to give. He only stopped after his family expressed concerns over his driving to St. Louis. After Martha’s death, on June 20, 2012, just 8 days before their 60th wedding anniversary, he continued to live at the couple’s home until mobility issues prevented living independently. He moved to the Glenwood for a short time, and then the Hitz Memorial Home in Alhambra where he has been a resident for just under 4 years. Gerald is survived by three children: Julia Carol Jenner of Terrapin Ridge, Mike Mollet Jenner and his wife, Jean Falter Jenner of Columbia, MO, and Mark Wallace Jenner and his wife, Dr. Tracy Hall, of Greenville. He also is survived by son-in-law Duane Aaron Schlemper of rural Pocahontas and his wife, Joyce Weiss Flamm Schlemper. He is survived by a 11 grandchildren (listed oldest – youngest): and four great grandchildren: Dan Schlemper, his wife Stephanie Schlemper and their daughter Kately Jane, of Lee’s Summit, MO; Jacob Schlemper and wife Tiffany Sanders Schlemper of Seattle, WA., and their children, Jane Aeryn and Elisha Gregory Duane; Gabe Jenner, his wife Megan Jenner and their daughter Avery Rose of Lee’s Summit, MO; Maureen Jenner of Carbondale, IL. ; Sara Schlemper of Seattle, WA; Abbie Flamm of Sedona, AZ. ; Michael Schlemper of Columbia MO. ; Carly Flamm of Lexington, KY.; Maddie Flamm, Joseph Jenner and Andrew Jenner of Columbia, MO. He is also survived by his first cousin and best friend of 95 years, H. Benjamin File and his wife Mary File, also residents of the Hitz. He is preceded in death by his wife, Martha Elizabeth Mollet Jenner, and his daughter, Jane Elizabeth Jenner Schlemper, as well as his eight older siblings. In lieu of flowers, memorials may be made to Mt. Nebo Primitive Baptist Church Cemetery. To send flowers or a remembrance gift to the family of Gerald E. Jenner, please visit our Tribute Store. "Email Address" would like to share the life celebration of Gerald E. Jenner. Click on the "link" to go to share a favorite memory or leave a condolence message for the family.